Supporters of Aung San Suu Kyi, leaders of the “Saffron Revolution,” leading ethnic cleansing of Myanmar refugees. People don’t just come out into the streets and begin murdering each other. There are always instigators on one side, perhaps both, leading the anger and violence. In the case of targeted Muslim Rohingya refugees in Myanmar’s Rakhine state, those leading the violence against them, which most recently involved 26 killed and 2,000 Rohingya homes destroyed, have been identified. 3. We Arakanese Don’t Want to Live With Extreme Bengalis Anymore. Image: Praying for genocide. While Associated Press claims these protesters are demonstrating against ethnic violence, the sign they carry clearly states that they seek the expulsion of the refugees from Myanmar, and are merely protesting against the Myanmar Army’s use of force to protect them from attacks that have left scores dead and thousands of refugee homes destroyed. Image: Real monks don’t do politics. The “venerable” Wirathu (front, left) leads a rally for “political prisoners” loyal to Aung San Suu Kyi’s “pro-democracy” movement in March, 2012. Wirathu himself has been often portrayed as an “activist monk” and a “political prisoner” who spent years in prison. In reality, he was arrested for his role in violent sectarian clashes in 2003, while Suu Kyi’s “pro-democracy” front is actually US-funded sedition. Wirathua has picked up right where he left off in 2003, and is now leading anti-Rohingya rallies across the country. While Western news agencies have attempted to spin the recent violence as a new phenomenon implicating Aung San Suu Kyi’s political foot soldiers as genocidal bigots, in reality, the sectarian nature of her support base has been back page news for years. AFP’s recent but uncharacteristically honest portrayal of Wirathu, with an attempt to conceal his identity and role in Aung San Suu Kyi’s “Saffron” political machine, illustrates the quandary now faced by Western propagandists as the violence flares up again, this time in front of a better informed public. 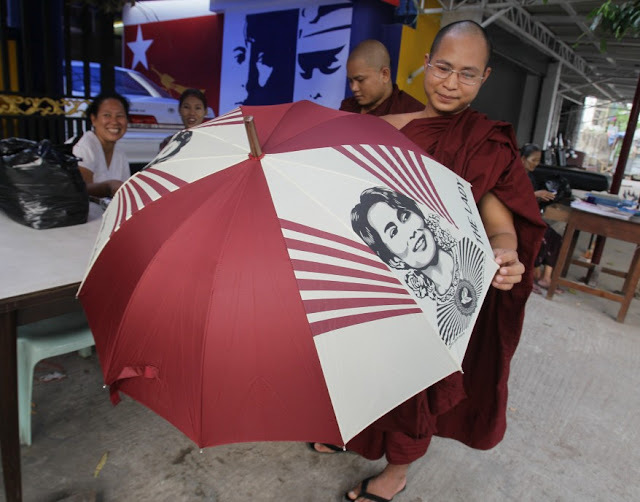 Image: An alleged monk, carries an umbrella with Aung San Suu Kyi’s image on it. These so-called monks have played a central role in building Suu Kyi’s political machine, as well as maintaining over a decade of genocidal, sectarian violence aimed at Myanmar’s ethnic minorities. Another example of US “democracy promotion” and tax dollars at work. 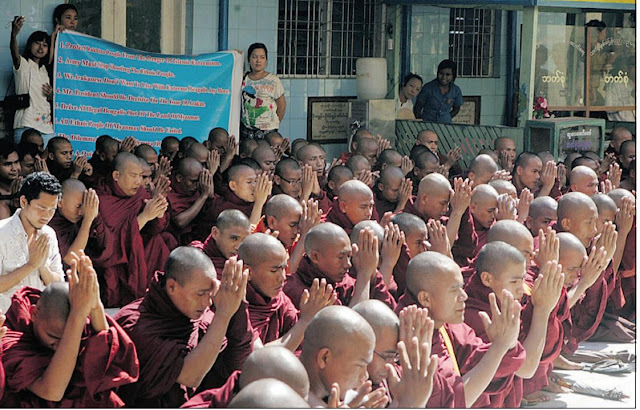 During 2007′s “Saffron Revolution,” these same so-called “monks” took to the streets in a series of bloody anti-government protests, in support of Aung San Suu Kyi and her Western-contrived political movement. HRW would specifically enumerate support provided to Aung San Suu Kyi’s movement by these organizations, including the Young Monks Union (Association), now leading violence and calls for ethnic cleansing across Myanmar. The UK Independent in their article, “Burma’s monks call for Muslim community to be shunned,” mentions the Young Monks Association by name as involved in distributing flyers recently, demanding people not to associate with ethnic Rohingya, and attempting to block humanitarian aid from reaching Rohingya camps. The equivalent of Ku Klux Klan racists demanding that America’s black population be shipped back to Africa, the US State Department’s “pro-democratic” protesters in Myanmar have been revealed as habitual, violent bigots with genocidal tendencies and enumerated designs. Their recent violence also casts doubts on Western narratives portraying the 2007 “Saffron Revolution’s” death toll as exclusively the work of government security operations. Like their US-funded (and armed) counterparts in Syria, many fighting openly under the flag of sectarian extremism held aloft by international terrorist organization Al Qaeda, we see the absolute moral bankruptcy of Myanmar’s “pro-democracy” movement that has, up until now, been skillfully covered up by endless torrents of Western propaganda – Aung San Suu Kyi’s Nobel Peace Prize and a recent showering of Western bestowed awards, all being part of the illusion. Sectarian Violence, Destabilization: What’s in it for the West? And not only does the US State Department in tandem with Western corporate media provide Aung San Suu Kyi extensive political, financial, and rhetorical backing, they provide operational capabilities as well, allowing her opposition movement to achieve Western objectives throughout Myanmar. 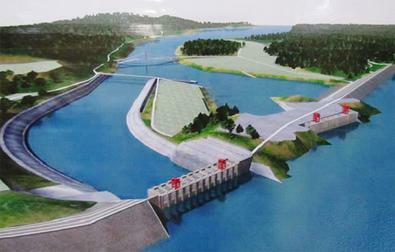 The latest achievement of this operational capability successfully blocked the development of Myanmar’s infrastructure by halting a joint China-Mynamar dam project that would have provided thousands of jobs, electricity, state-revenue, flood control, and enhanced river navigation for millions. Suu Kyi and her supporting network of NGOs, as well as armed militants in Myanmar’s northern provinces conducted a coordinated campaign exploiting both “environmental” and “human rights” concerns that in reality resulted in Myanmar’s continual economic and social stagnation. Image: (Top) The “Lilliputians” though small in stature were collectively able to tie down the larger Gulliver from the literary classic “Gulliver’s Travels.” In the same manner, the US wants to use smaller Southeast Asian nations to “tie down” the larger China. 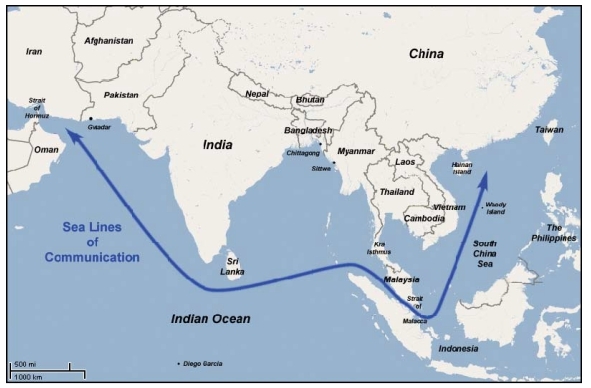 The US Army’s Strategic Studies Institute 2006 publication, “String of pearls: Meeting the Challenge of China’s Rising Power Across the Asian Littoral” details US geopolitical awareness of China’s growing influence throughout Asia and enumerates a plan of action to balk it while maintaining American preeminence. While Kagan’s paper details a broader geopolitical strategy, the SSI report specifically mentions where China is expanding its influence. Image: Figure 1. From SSI’s 2006 “String of Pearls” report detailing a strategy of containment for China. While “democracy,” “freedom,” and “human rights” will mask the ascension of Aung San Suu Kyi and others into power, it is part of a region-wide campaign to overthrow nationalist elements and install client regimes in order to encircle and contain China. Violence in areas like Sittwe, Rakhine Myanmar, or Gwadar Baluchistan Pakistan, are not coincidences and documented evidence indicates immense Western backing for armed opposition groups. The report was written in 2006 – and clearly the West has gone through great lengths since then to destabilize, neutralize, or isolate from China’s influence each and every one of these “pearls.” Indeed, the state of Rakhine in southwest Myanmar is being developed by China as stated in the SSI report. The city of Sittwe is the site of a Chinese-built port, and Kyaukpyu is the future site for the terminal of a trans-Myanmar oil pipeline linking Chinese oil tankers incoming from the Middle East directly with China’s Yunnan province, negating the lengthy trip around the Strait of Malacca and across the South China Sea. By destabilizing Rakhine state, either through this current violence, or by “radicalizing” groups within the Rohingya and expanding the violence further still, the West can ensure that progress is slow, or all together brought to a halt, just as it has with Chinese projects up country, or even abroad in nations like war-torn Libya or Pakistan’s now destabilized Baluchistan province. The SSI report also mentions Chittagong, Bangladesh, which also, coincidentally, has been dragged into neighboring Myanmar’s violence. A library of policy papers detailing the US’ strategy vis-a-vis China’s emergence is available for the public to read. However, these papers are written in academic English and require demanding prerequisites across a variety of disciplines to understand. 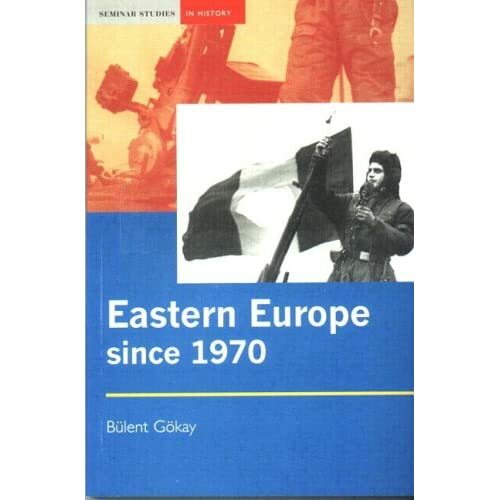 It also requires effort greatly exceeding that needed to merely consider and accept base arguments made by prominent and prolific Western media services. There is always more to a story than mere superficial religious or ethnic differences – and if a news story fails to address this, it has failed to report the truth. This entry was posted in Cultural Studies, Current Affairs, Global Shift, History, International Relations, Political Economy, Politics, Post-colonial Studies and tagged Aung San Suu Kyi, “Saffron Revolution", Burma, China, colonialism, Decline of US, Global Crisis, Global Hegemony, Global Shift, Global South, Imperialism, Muslims, Myanmar, neo-liberalism, Noble Peace Prize, Post-Colonialism, Power Shift. Bookmark the permalink.